His Eminence, the Most Reverend Archbishop Iakovos (Coucouzis) of America (July 29, 1911 - April 10, 2005) was primate of the Greek Orthodox Archdiocese of North and South America from 1959 to 1996, making him the longest serving bishop in that capacity. He was also the founding president of SCOBA in 1960 and served thus until his retirement in 1996. Iakovos was well-known for his work to make Orthodoxy visible in American society and for his tireless work in civil rights. The dream and continual struggle of his episcopacy was to see the full union of Orthodoxy in America, to be transfigured from "parochial to truly Orthodox Christian people," from "separate jurisdictions to one jurisdiction," from "many ethnic groups to one group, headed and dominated by Christ our Saviour and our Lord," as he said at the 1994 Ligonier Meeting. Iakovos was born Demetrios A. Coucouzis on the Greek island of Imvros (Turkey) in 1911 to Maria and Athanasios Coucouzis, one of four children, including two sisters (Virginia and Chrysanthi) and a brother (Panagiotis). He enrolled at the Ecumenical Patriarchal Theological School of Halki at the age of 15, where he earned a Master's Degree in Orthodox Theology, graduating in 1934 with high honors. Demetrios was ordained to the holy diaconate in 1934, receiving then the name Iakovos, and he served as a deacon to Archbishop Athenagoras (later Ecumenical Patriarch). In 1940, Iakovos was ordained to the priesthood in Lowell, Massachusetts, serving churches in Connecticut, St. Louis, and New York, and also serving as the assistant dean of Holy Cross Greek Orthodox School of Theology (Brookline, Massachusetts). In 1942, he was appointed as dean of Annunciation Cathedral in Boston and served in that capacity until 1954. During this time, he earned a Master's degree in Sacred Theology from Harvard Divinity School (1945) and became a U.S. citizen (1950). In 1954, Iakovos was elected to the episcopacy and appointed as Bishop of Melita by Ecumenical Patriarch Athenagoras, being consecrated the following year. In 1956, he was elevated to the rank of metropolitan. Between 1955 and 1959 he served as representative of the Ecumenical Patriarch of Constantinople at the World Council of Churches in Geneva, Switzerland. In 1959, he became the first Greek Orthodox archbishop to meet with a Pope of Rome in 350 years, visiting Pope John XXIII as a special emissary of Patriarch Athenagoras. He was elected as primate of the Greek Orthodox Archdiocese of North and South America on February 14, 1959 by the Holy Synod of the Church of Constantinople, and on April 1 of that year Iakovos was enthroned as Archbishop of America at Holy Trinity Cathedral in New York City. Shortly after his appointment as primate of Greek Orthodoxy in the Western Hemisphere, Archbishop Iakovos founded the Standing Conference of the Canonical Orthodox Bishops in the Americas (SCOBA), serving as its president until his retirement in 1996. It was his first major step in attempting to bring about Orthodox Christian unity in America, a cause he championed and with which he was strongly associated for all the years of his episcopacy. Archbishop Iakovos made national headlines while marching alongside Rev. Dr. Martin Luther King, Jr. for civil rights in the 1960s, an act which characterized his commitment to social justice as part of the ministry of the Church. His march with King was immortalized on the cover of the March 26, 1965 issue of Life Magazine, where he stands photographed alongside King as part of the latter's march in Selma, Alabama. In doing so, Iakovos was one of the first national religious leaders to take a role in American civil rights. In January of that same year, he accompanied Patriarch Athenagoras to Jerusalem to meet with Pope Paul VI and then later to Rome, where the two primates declared a lifting of the anathemas of 1054. In 1974, he initiated a campaign to assist Greek Cypriot refugees following the Turkish invasion of Cyprus. In 1994, Iakovos presided over the historic Ligonier Meeting in western Pennsylvania at which the assembled American Orthodox bishops came together, exppressing their essential unity and denouncing the notion of constituting a "diaspora." 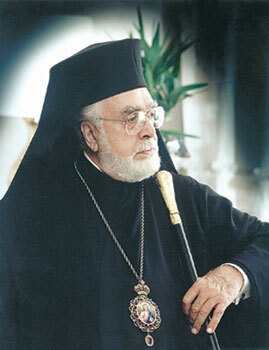 His leadership was strongly influential at this meeting, and it is believed that fears that he was going to have himself declared "Patriarch of America" led to his forced retirement at the age of 85 on July 29, 1996 by Patriarch Bartholomew I (Archontonis) of Constantinople, with whom Iakovos had a long-standing rivalry. On April 8, 2005, the archbishop was admitted to the hospital in Stamford, Connecticut, suffering from a pulmonary ailment, and he reposed in the Lord on April 10. His funeral was on Thursday, April 14, at Holy Trinity Cathedral in New York City, and his burial was held Friday, April 15, at Holy Cross Greek Orthodox School of Theology. Archimandrite Serafim (Surrency), writing in 1973 in his The Quest for Orthodox Church Unity in America, had this to say about Iakovos: "It would be no exaggeration to say that both in the eyes of the American public as well as in ecclesiastical circles as well (sic), Apb Iakovos was the titular and actual leader of Orthodoxy in America" (p. 103). In his endeavours to relate to members of other religions, some Orthodox felt that Archbishop Iakovos went entirely too far, that he violated the canons and betrayed the faith by praying with heretics. Perhaps one of the more famous instances of an Orthodox hierarch rebuking Archbishop Iakovos was Metropolitan Philaret (ROCOR) writing an open letter in 1969 on the occasion of Iakovos's participation at St. Patrick's Cathedral in the "Week of Prayer for Christian Unity" and the "Ecumenical Doxology" in the Greek Cathedral of the Holy Trinity in New York City. In this letter, Philaret says: "You are uniting with the heterodox not in truth but in indifference to it." During his tenure as archbishop, Iakovos drew a great deal of criticism from those especially concerned about his activities pertaining to ecumenism. His own definition of ecumenism was as follows: "Ecumenism is the hope for international understanding, for humanitarian allegiance, for true peace based on justice and dignity, and for God's continued presence and involvement in modern history" (ca. 1960). Some of his personal correspondence is also scheduled to be published in Greek and English. This page was last edited on February 27, 2012, at 20:57. This page has been accessed 54,015 times.